A genre ridiculed in public, but secretly enjoyed; the ‘couch painting’ has a bad reputation. Yet, the unbreakable but limited connection between the couch and the painting is the subject of ‘A Couch to Match the Painting’. The resentment against the couch painting is not merely being reversed. The painting is reduced to what it really is: an object made of the materials stretcher frame and canvas. 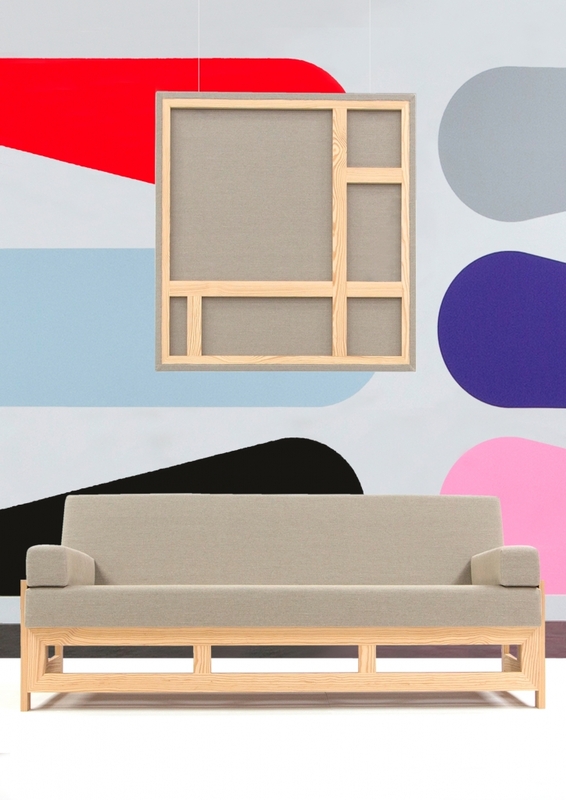 So the connection between the couch and the painting is not being affirmed, but stripped down to its constituent parts and redefined. ‘A couch to match the painting’ is one of the 13 installations that are being made for an international museum exhibition in Japan. Prior to this exhibition the works will be on display on various locations. Earlier work shown includes ‘waiting in the hallway’ at the Music Hall in Amsterdam and ‘Lounge Chairs’ at Museum Sculptures at Sea in The Hague. The installation is exhibited in a duo presentation with Jan van der Ploeg’s Wall Painting no. 397. Whereas Stallinga reduces the painting to its bare material essence, Jan van der Ploeg, by contrast, elevates the wall into a canvas. In his wall-paintings he applies a diminished colour palette: monochrome coloration, repetition and anti-illusionist depth are the different shapes he borrows from industrial imagery. The installation was on display at New Dakota Centre of Contemporary art in Amsterdam from January 11th till March 8th 2015.